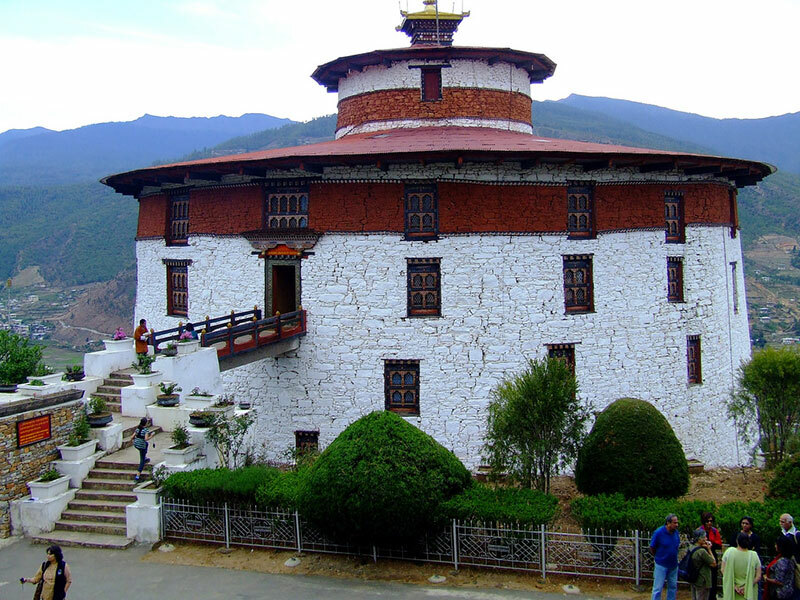 Bhutan was threatened with numerous attacks from Tibet in the mid-17th century and the temporal ruler at the time built the Paro Ta Dzong (watch tower) to protect the Paro Rimpung Dzong against these invaders. The watch tower is built above the Paro Dzong. According to the history, the Dzong’s fourth floor was used as a prison cell in the past. A removable bridge connected the prison cell with the third floor and the fifth floor isolating the fourth floor. This strategic design was used to successfully confine the prisoners. An underground passage is said to have existed connecting the Dzong to the Pa Chu River. The secret tunnel was used to fetch water during times of war. Unlike other Dzongs in the country, the Ta Dzong has a circular shape built with two and a half meter thick wall adorned with traditional windows spread sporadically. The structure is completely built of stones and wood, without the use of nails. After remaining uninhabited for a long time, upon the command of the third King of Bhutan, Jigme Dorji Wangchuck, the Dzong was renovated and inaugurated as Textile Museum in 1968. The National Museum is a major tourist attraction today. It houses many antique and precious objects ranging from ancient and modern scroll paintings (Thangka), earthen, copper and bronze pots dating back to 17th century and variety of swords. There are also exhibits of objects and artifacts relating to insects and animals of Bhutan, ancient arms and weapons and farming tools. Some of the highlight of the museum’s collection include an egg laid by a mule, a horse horn, original iron links used to build the Tamchog suspension bridge and stone axe (Namchag) which was used during warfare and hunting. This monolith dates back to the Stone Age.